Is a giant capuchin, in or close to the genus Acrecebus, a better candidate for the bone-smashing than Homo sapiens? In the spring of 2017, the world’s leading multidisciplinary science journal, Nature, published a claim that humans or other hominins had smashed the femurs and teeth of a mastodon with stone cobbles 130,000 years ago at a site named for Richard Cerutti, a San Diego Natural History Museum field paleontologist who is credited with its discovery in the early 1990s next to State Route 54 in what’s now San Diego. Many critics of this “insupportable” claim have questioned the Cerutti team’s archaeology, arguing that the mastodon’s femurs were not necessarily smashed by human agency, but by the backhoe, perhaps, that exposed the site, or by torrential flows of water. Others have expressed doubts about the team’s geochronology, contending that they failed to prove that the breaking of those bones took place 130 thousand years ago. I will argue, however, that the Cerutti team’s archaeological and geochronological investigations were expertly and meticulously done, and that the bones in question were, in fact, deliberately smashed with hammerstones after being placed on other rocks serving as anvils, and that this smashing was done some 130 thousand years ago. My disagreement is not, in short, with the Cerutti team’s factual findings, but rather with their conclusion that there is “no other way that the material of the Cerutti Mastodon site could have been produced than through human activity.” In this article I suggest that it is more likely that the Cerutti mastodon’s bones and teeth were smashed by an individual or individuals of a large platyrrhine monkey species descended from, or otherwise related to, the giant capuchin Acrecebus fraileyi. To see why the Cerutti team’s claim caused such a furor, we have to take a look at the generally accepted view—the view that was in any event the generally accepted one before the team’s Nature article was published—of when humans first came to the Americas. 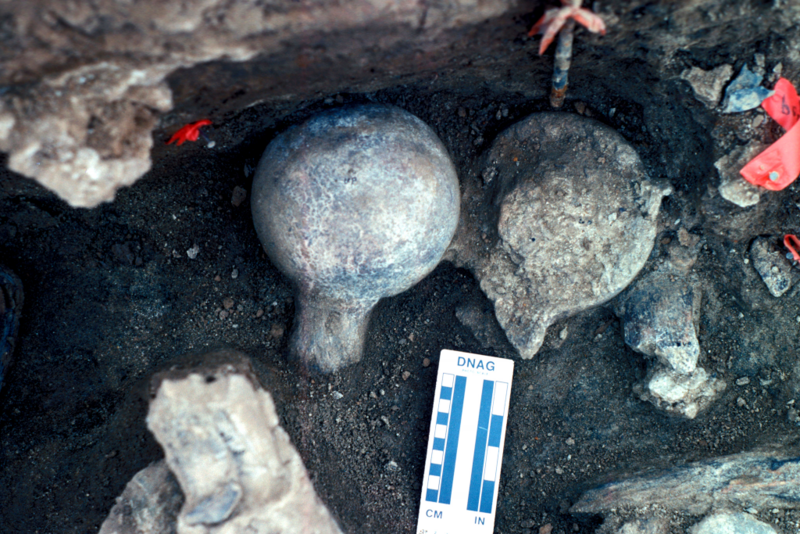 During the second half of the 20th Century, it was widely believed that members of our species made their first appearance in the Americas shortly before 13,000 years ago, when distinctive tools and weapons of the so-called Clovis culture make their first appearance in the archaeological record. 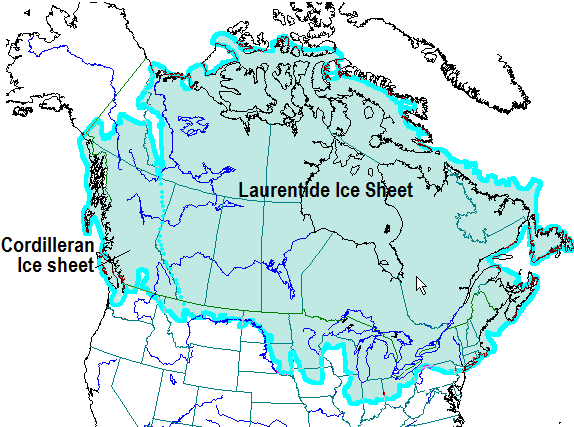 After the turn of the 21st Century, however, previously discounted evidence combined with new discoveries to show that humans—probably successive waves of humans—had already been finding their way through, and/or around, the Cordilleran-Laurentide ice sheet into what is now the contiguous United States beginning as early as 15,000 years before the present. Thanks to Steven Earle, Physical Geography, 2017, BC Open Texbooks, Ch. 16.1. There have been several other claims that humans had arrived in what is now the contiguous or lower 48 United States before the LGM, but they, too, have failed to find general acceptance. Nobody who claims a place inside the tent of science had ever suggested, however, that members of the human family found their way into North America as long ago as a hundred and thirty thousand ago—nobody, that is, until the Cerutti team published their 2017 claim. For reasons I’ll discuss presently, I share Haynes’ skepticism about the Cerutti team’s claim that humans were present in North America 130 thousand years ago, but I can’t accept his suggestion that the bones and rocks found at the site could have been chipped by being crushed against each other under the overlying sediment by the pressure exerted by the backhoe that exposed the Cerutti site. That scenario is inconsistent with the fact that sharp bits of broken rock were found “peppered” over the whole site, one of which could be refitted to its “parent” rock (CM 423) lying more than three meters away. If a backhoe had broken the rocks and bones by crushing them together under a blanket of sediment the way Haynes suggests, those fragments would have been found very near to the places where the crushing took place: chips will fly if you chop a bone or a rock, but only if they can travel through the air. The fragmentation patterns and percussion bulbs displayed by the broken bones are strongly suggestive, moreover, of repeated “dynamic point loading.” In English, that means that the bones show signs of having been broken by repeated blows. The bone fragments were also coated in thick crusts of carbonate whose accretion around those fragments must have taken thousands of years. Three of the five large rocks found on the site display the kind of chipping, crushing, pitting and scratch marks that indicate they were the instruments that delivered those blows. The flat shape, positioning and markings on two other rocks, (CM 281 and CM 114,) suggest that they were used as anvils. Another skeptic, Professor Tom Dillehay, an anthropologist-archaeologist at Vanderbilt University, suggests the wear patterns on the five rocks could have been produced by collisions with other rocks while they were being rolled along by water action. That does not add up either. Rolling, colliding rocks could not have come to rest at this site accompanied by so many of the flakes knocked off them by their collisions—especially if those flakes still consisted, as they did here, of sharp, unworn pieces that could, as I’ve mentioned, be refitted in some cases to rocks from which they were chipped. The five large rocks and the partial mastodon skeleton were found, moreover, in a nearly forty-foot-thick series of silt sediments, compressed and cemented into a “siltstone” compound. The silt had been deposited by slow-moving water. Subangular (i.e. partly water-worn) gravels interspersed among those silts were deposited by low-energy flows like braided streams or stream overflows, rather than by torrential discharges that could have moved large rocks. The rocks appear, therefore, to have been carried into the mastodon site by some other agency. The case for the site being 130,000 years old appears to rest on just three uranium-series dates. I’d want to see Cerutti Mastodon covered in more dates than a [date] palm tree before claiming it was in the last interglacial. Dennell’s skepticism is understandable. The 130 kya date claimed by the Cerutti team is followed by more than a hundred thousand years without any evidence of a hominin presence in the Americas. Moreover Dennell, one of the foremost authorities on hominin migration into Eastern Asia, tells us that “[t]here is not a whisper of anything that age in northeast Asia.” That’s significant, because there’s little doubt that northeast Asia was the staging area—the anteroom—for human entry into the Americas. The oldest evidence of a human presence in northern Siberia found to date, a mammoth kill-site near the mouth of the Yenisei river some 7,000 kilometers west of the Bering Strait, goes back only 45,000 years. That’s not nearly close enough, in either time or in space, to lend credibility to a 130 kya human presence in North America. Dennell’s incredulity is well founded, and his opinions carry weight—the depth and clarity of his insights in the field of paleoanthropology are exceptional. But he is not, and doesn’t pretend to be, an expert on geochronology. I suspect his reluctance to accept the dating of the Cerutti Mastodon site is simply a consequence of his awareness as an expert on the spread of hominins and humans, of the extreme unlikeliness of Homo sapiens or any other kind of hominin being present in North America 130,000 years ago. We can’t, however, avoid that problematic conclusion by simply assuming, without further enquiry, that the dating of the Cerutti site has got to be wrong. The great age of the site is beyond question. Sediments encasing the bones and rocks were originally tested with optically stimulated luminescence. This method, which can only reach back between sixty and seventy thousand years into the past, indicated a date at or beyond that limit. A sixty-thousand-year age would already have stood the world of paleoanthropology on its head, but all indications are that the even more sensational 130 kya date is reliable. In an interview with Ars Technica, the Associate Director of the pioneering Berkeley Geochronology Center, Warren Sharp, another expert on U-series dating, added his endorsement of the Cerruti team’s dating methods to that of Rainer Grün. The archaeology is also solid. There is strong evidence that the mastodon bones in question were smashed on rocks used as anvils by other rocks used as hammers. All three archaeologists who reviewed the paper for Nature accepted that evidence. The five large rocks found on the site were not chipped by geological processes like strong flows of water, and the mastodon’s femurs and teeth were not crushed by pressure on the sediments in which they were found, nor broken by the bites of large carnivores, or by trampling. Are there no alternative explanations for the deliberate smashing of these bones 130,000 years ago by humans or members of the human family? Chimpanzees usually use their hammerstones with one hand, and Fullagar may have assumed that all primate hammer-users (except humans) would use that one-handed method. Capuchin monkeys, however, typically (but not invariably) grasp their hammerstones with two hands and are able to manipulate those stones with a high degree of precision. The target object is carefully placed on a flat place, or in a crater or dimple in the rock or stump they’re using as the anvil. The monkeys reposition the target on the anvil when necessary, and inspect its husk or shell to see how close it is to breaking, modulating the force they’re using so as not to crush the edible content. Look, for example, at this video clip of a capuchin using a hammerstone. When the Cerutti mastodon’s bones were smashed in the Late Pleistocene, however, several platyrrhine (i.e. New World) monkey species that were very much larger than their still-existing relatives were still in existence. A pioneering Danish paleontologist and physician named Peter Wilhelm Lund discovered the first of these mega-monkeys, which he named Protopithecus brasiliensis, in the Brazilian state of Minas Gerais in 1836. The only remains of this giant monkey found by Lund were a left proximal femur and right distal humerus. The dimensions of these bones suggest that Protopithecus had a body mass of about 23 kg.—just over 50 lb. Those two bones also preserved enough distinctive features to place the animal in the Atelinae tribe, presently occupied by spider and woolly monkeys, and the muriqui Brachyteles. The second skeleton found in the Toca da Boa Vista was that of a monkey that had an estimated body mass of 25 to 28 kilograms (i.e. ~55 to 61 pounds). 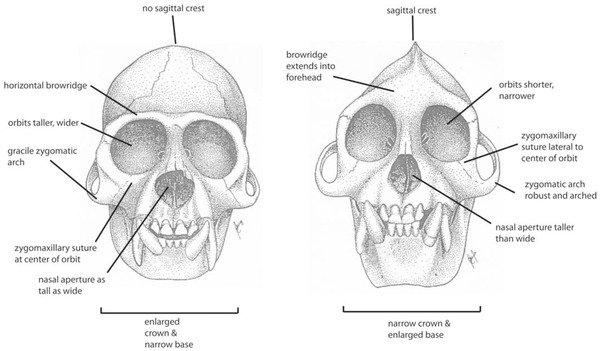 The limb-bones of this species resembled those of the Ateline or spider monkey tribe, while the general shape of the skull, and a space for a large vocal apparatus near the throat, spoke of a connection with the Alouattinae or howler monkey tribe. This portmanteau of spider and howler characteristics was named Cartelles coimbrafilhoi. The idea that a capuchin might break open bones that it came upon as a scavenger, to gain access to their contents, is not necessarily an outlandish one. I could only find one instance of capuchins eating a carcass that they had found, rather than hunted, but during the Pleistocene when South America’s cerrados were home to an enormous diversity of big herbivores such as mastodons, gompotheres, rhinoceros-like toxodons and big-to-huge ground-sloth species, predation by giant short-faced bears, sabertooth cats and jaguars would have created many more opportunities for scavenging and, specifically, for accessing marrow and trabecular (spongy) material by smashing bones. The jaws of even the biggest and most powerful of the New World predators, the giant short-faced bear Arctodus, would not have been powerful enough to break open the diaphyseal or mid-shaft portion of a mastodon femur. Everyone, including Dr. Holen and his co-authors, would presumably agree that there were no hominins anywhere in the New World for the first 90% of the 2.5-million-year-long Pleistocene epoch. During that time, therefore, any species with the ability to break open the resilient bones of the largest species of megafauna with hammerstones would have enjoyed a monopoly over their calorie-rich contents. Is there any evidence, however, indicating that a capuchin big enough to wield a hammerstone that could smash a mastodon femur had existed in the New World at any time? Multivariate regression analysis based on further remains of LACM 134880’s species is needed, of course, for a reliable estimate of its size, but awareness of the fact that Cebus and Sapajus, had, until some indeterminate time in the past, a very large “sister taxon,” should already make it clear that the suggestion that a capuchin monkey could have smashed the Cerutti mastodon’s femurs can no longer dismissed out of hand. 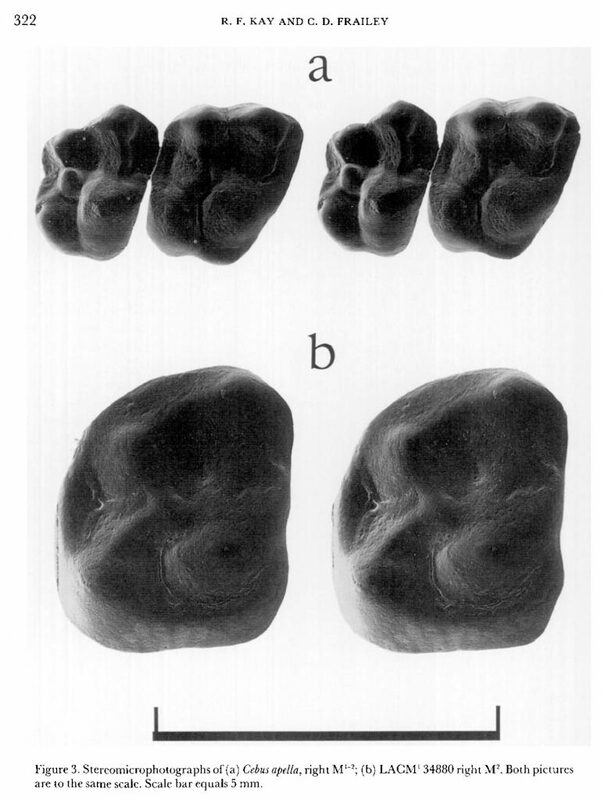 When the LACM 134880 molar was described and reported by Richard Kay and Donald Frailey in 1993, they “resisted naming a new genus and species based on one tooth,” but then, in 2006, Kay, writing with Mario Cozzuol, decided that “the specimen should be named and that its morphology justiﬁes placing it as the sister taxon to extant Cebus.” They called it Acrecebus frailey. Unlike the other giant platyrrhines we talked about previously (Protopithecus, Caipora and Cartelles) which all date from the late Pleistocene, an epoch which ended only 11,700 years ago, Acrecebus was dated (by the kinds of fossil vertebrates associated with it in the layer in which it was discovered) to the Huayquerian Land Mammal Age near the end of the Miocene, 9 to 6 million years ago. Was Acrecebus (or a descendant species, and/or some other large capuchin species) still in existence in the later Pleistocene when the Cerutti mastodon’s bones were smashed? The Pleistocene fossil record of the New World primates is so sparse when we compare it to the great diversity of the living platyrrhines, that it represents only a small fraction of the species that must have been in existence during that epoch. The Cebinae or capuchin subfamily, specifically, which today comprises two genera divided into twelve species and numerous subspecies, is represented in the Pleistocene fossil record by only two species, each known only from a single specimen. There is, therefore, only a two-out-of-twelve, or 16.66%, chance for an existing capuchin species (i.e. one that must have been present in the Pleistocene) to be represented in the fossil record of that epoch as it is presently known to us. There would be an equally low chance, therefore, that any capuchin that was wiped out in the end-Pleistocene extinction spasm would be present in that record. The dust of that extinction episode has settled so completely during the last ten millennia that we tend to regard the present ecological dispensation as the “natural” state of the world. In this new normal, platyrrhine monkeys are all relatively small. The discoveries of Protopithecus, Caipora and Cartelles, the three recently extinct mega-monkeys we’ve been talking about, go some way toward dispelling that illusion, but it is highly probable, in my view, given how poorly the platyrrhine group is represented in the Pleistocene fossil record, that those three species were the not the only giant platyrrhines that were wiped out in the end-Pleistocene extinction that followed the penetration or circumvention of the Cordilleran/Laurentide ice sheet by Homo sapiens some 15 kya. The history of Madagascar’s extinction spasm offers us an instructive example of how selectively, and how completely, a primate fauna can lose its large members after its first contact with our species. Humans first set foot on Madagascar about 350 years BCE, and, by the 15th century CE, this roughly California-sized island had lost 40% of its lemur genera—some 17 species. All those extinct species, including the smallest (a species in the genus Pachylemur), were larger than the largest surviving lemur, Indri indri. The biggest of the vanished lemurs, Archaeoindris fontoynontii, was the size of a gorilla. Members of the genus Megaladapis, three species that looked like vastly oversized koalas, had body masses of about 50 kg., while species in the long-armed genus Paleopropithecus (which lived “inverted quadrupedal” lives, i.e. spent a lot of their time hanging upside-down from branches like the still-living sloth species do) ranged from the size of gibbons to that of chimpanzees. The human invasion that destroyed Madagascar’s giant lemurs swept away many other large species, including two giant tortoise species and the huge (300–500 kg) bird Aepyornis maximus. I’ve argued that the giant capuchin Acrecebus fraileyi or its descendant species, and/or other large capuchins, could have been part of the New World’s Pleistocene fauna, and that a capuchin the size of Acrecebus would have been able to pick up an 18 kg stone. Let’s ask ourselves, now, whether a mega-capuchin of that kind might also have been likely to use a rock of that size as a tool. To answer this question, we have to take a closer look at the evolutionary history of the capuchin group. Sapajus can eat much harder, tougher foods than Cebus, which is heavily dependent on ripe fruit. The demanding nature of durophagy (the zoological word for the business of eating resistant foods) is apparent in the powerful, buttressed mandible or lower jaw of Sapajus, and the bony crest on the top of its skull. That crest, and the robust zygomatic arches you see curving out of the sides of the Sapajus skull, are attachment points for the powerful jaw muscles needed for the business of chewing tough foods. These forest domains would have been separate, or only tenuously connected with each other. Compiled by Jonathan Adams, Biological Sciences, Seoul National University, Gwanak-gu, South Korea. Compiled by Jonathan Adams, Biological Sciences, Seoul National University, Gwanak-gu, South Korea. 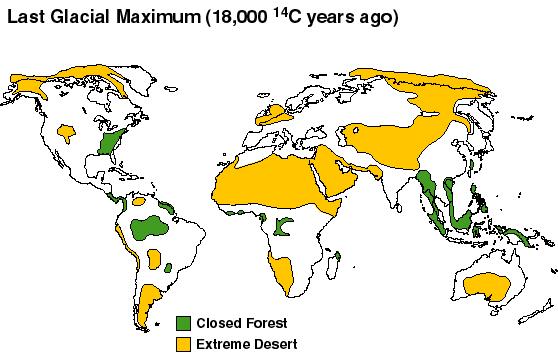 As can be seen from this map, South America’s Atlantic forest was severely reduced during these glacial phases. It was also fragmented, probably, into sheltered ravines or strips (“bandas”) of forest clinging to the banks of some remaining rivers. In the place of this retreating forest, came cerrados (savannas in which trees were mixed with grasses and shrubs), and caatingas (semi-deserts in which cactuses were associated with drought-tolerant grasses and thorny, deciduous scrub). 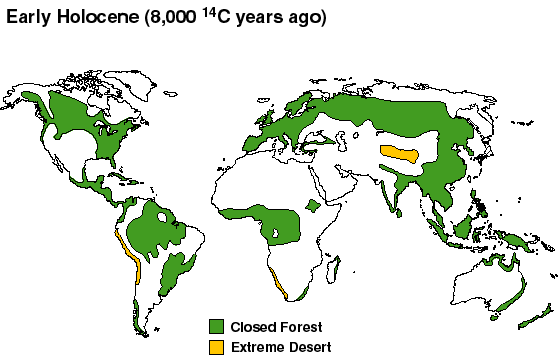 In response to the world-wide drying trend which began in the late Miocene, the Poaceae—the grasses—increased in both abundance and diversity. Several members of the family independently developed the so-called “C4” photosynthetic pathway which enabled them to live and thrive in areas which would otherwise have been too arid for them. Grasslands are, on the face of it, much less productive than tropical jungles, but the counterintuitive fact is that C4 grass can make solar energy available as food at a faster rate than jungle vegetation. That’s why there are more big animals, and more kinds of big animals, on Africa’s savannas than in its jungles. South America’s grasslands supported, as we’ve already seen, an Africa-like diversity of big grazers until the vast majority of the continent’s big animals disappeared near the end of the Pleistocene. Sapajus was not pushed into extinction by the periodic fragmentations of its Atlantic forest home we’ve been discussing. It was to survive, not by evolving the specialized dentition and digestive systems of big grass-eaters like buffaloes and horses, but by developing, instead, the ability to live off “high quality” savanna foods like roots, bulbs, seeds, hard fruits, arthropods (i.e. insects, spiders, crabs and scorpions), amphibians, birds, eggs, lizards, snakes, and a variety of small mammals including bats. On the other side of the Atlantic ocean in Africa, another suite of primates—vervet and patas monkeys, various baboon species, some chimpanzee populations and several kinds of upright-walking hominins—were making the same kind of adjustment to life on the emerging savannas, living off a broadly similar range of foods. Finding the stick he’s using for this purpose inadequate, he discards it. Moving quickly to a nearby bush, he breaks off a branch and deftly removes its leaves and side-branches to shape a more suitable “extractor,” with which he succeeds in prying the scorpion out of its refuge and making a meal of it. Stone tool use, writes Jessica Lynch Alfaro of the University of California and her co-authors, “would appear to be ubiquitous across robust capuchin [i.e. Sapajus] populations in dry habitats.” Sapajus does not, however, only use hammers in dry environments. In Suriname’s Raleighvallen Nature Preserve, a jungle environment in which suitable stones are presumably less easily obtainable, a young male Sapajus apella was observed using a “baton-like branch segment” as a hammer to fracture a large, thick-husked fruit, using a branch some distance above the ground as an anvil. Lynch Alfaro and her co-authors assert that, in contrast to this rich record of stone-tool use by Sapajus, “stone tool use has never been reported in the wild for any Cebus species.” This video, however, shows a wild capuchin (identified by the uploader as C. albifrons, and clearly habituated to humans) pounding a nut with a stone hammer in Puerto Misahuallí, a jungle town in Ecuador, while a juvenile of the same species makes ineffectual attempts to do the same with a branch. In the main, however, Lynch Alfaro’s statement is correct: Cebus has very seldom been seen to use any hammer- or club-like tools to strike target items. The only other instance I was able to find, was a report by Sue Boinsky of an adult male C. capucinus using a branch to club a venomous snake in Costa Rica. Boinsky reports that the animal in question fumbled, missing his target several times, frequently dropped the branch, and needed more than fifty blows to kill the snake. Striking a target object with a hard object is referred to as “active percussive technology.” Taking hold of the target object itself, and pounding it against a hard surface is, on the other hand, termed “passive percussive technology.” That’s an easier technology to master, and Cebus has done so: here is a C. capucinus using “passive percussion” to open clams. Having said that the intelligence shared by Cebus and Sapajus is synapomorphic, I have to add a qualification which may already have become obvious: Sapajus is quite a bit smarter than Cebus. Sapajus scores 3.49 on Jerison’s encephalization quotient (EQ) vs. 2.54 for Cebus. EQ is based on the ratio between an animal’s actual brain size and the brain size expected for an animal of that body size. The size of a brain does not, however, correlate perfectly with its power. For this and other reasons, Jerison’s EQ formulation has not reduced intelligence to an objectively quantifiable faculty. Within certain limits, however, it can be a meaningful yardstick: the fact that Sapajus scores a significantly higher EQ than Cebus accords well, for instance, with the observable fact that the former’s tool-use is considerably more sophisticated and complex than that of the latter. Why is Sapajus so smart? Open environments like Africa’s veld, and South America’s cerrados and caatingas, offer a wider variety of high-quality nutritional resources than closed forest habitats. The nutritional promise of such environments is matched, however, by the challenges they offer to a would-be exploiter: many calorie-rich savanna foods are concealed or embedded, and can only be accessed by what’s referred to as “extractive” foraging. It’s possible (as we’ll see presently) to live on high-quality savanna foods without using tools, but many of those food items can only, or more easily, be secured with their aid. The tough husks of certain fruits, the hard shells of some nuts, the carapaces of adult tortoises and the cortices of large bones must, for instance, all be overcome with percussive technology—smashed—before their contents can be eaten. Likewise, tools such as the stones at least one Sapajus species uses to soften earth and rake it out of the way can (like the pointed bones which the robust hominin Paranthropus is thought to have used as digging implements on the African veld ) make it easier to exploit underground resources such as roots, bulbs, corms and burrowing arthropods. Tool-use can, therefore, be a very advantageous niche. It requires, however, a generalized kind of brain power whose development presents evolution with a more complex and time-consuming task than the assembly of relatively simple “instinctual” responses (like the impulses, say, that prompt some moth species to execute crash-dives when they hear a bat’s echolocation squeaks). Although the use of tools may have been an important stimulus for its evolution, generalized intelligence cannot, by definition, be restricted to that activity. A species or group that has developed relatively sophisticated tool-using skills, may find, therefore, that the mental skills it had to evolve for that purpose, could begin to open a door to a wider “cognitive” niche. I’ve argued that Sapajus began to evolve the capabilities required for semi-terrestrial foraging in “open” or un-forested environments in response to the late Miocene drying trend. But those new capabilities would not, as I’ve just mentioned, necessarily have included tool-use and its mental prerequisites: thriving populations of baboons, patas monkeys and vervet monkeys show that it is entirely possible for primates to make a living on the African savanna with only minimal and occasional use of objects as tools, or none at all. Given, though, that tool-use has such obvious benefits, why didn’t any of these African savanna primates evolve the sophisticated tool-using abilities that Sapajus possesses? The answer may lie in the competitive exclusion principle. That principle tells us that two species or groups competing in the same ecological niche cannot, in the long term, continue to share that niche. When one of them has even the slightest advantage over another, it will eventually bring about either the extinction of the other, or its retreat to a different niche. The first group to occupy a given niche can, moreover, also prevent others from evolving the skills to enter it, and, for at least the last 3 million years, and probably a great deal longer, Africa’s tool-using niche has been occupied by hominins. Do we need another planet Earth—a parallel one without Homo sapiens—to see what capacities “lesser” primates like monkeys might have developed if hominins and their anthropoid relatives had not been around to take possession of the cognitive niche? The composition of the fossil fauna identified in the regions in which the other large Pleistocene platyrrhines Protopithecus, Cartelles and Caipora were discovered, indicates that they, too, lived in savanna-like surroundings. Eckhard Heymann of the Abteilung Verhaltensforschung/ Ökologie at the Deutsches Primatenzentrum argues that, because they lived in this relatively open environment, and because the body mass of these species probably exceeded the limit for brachiation, Protopithecus, Cartelles and Caipora were likely to have been at least partly terrestrial. Their large size, he suggests, might have mitigated the added risk of predation they would have encountered on the ground. Adult members of these species, as big or bigger than adult male baboons, would have been safe from smaller cats like ocelots and jaguarundis, and might at times, acting together, even have been able to confront predators as large as pumas and jaguars. Here you can see terrestrial African primates of comparable size driving off a leopard. Would multiple capuchin genera and species, including both giant forms such as Acrecebus fraileyi and smaller ones, have been able to occupy the tool-using niche simultaneously? We know that Cebus and Sapajus are “sympatric” (i.e. both present) in many southern regions of the Amazon basin, and that Sapajus tends to have higher population densities than Cebus in such shared environments. Alfaro and her colleagues think that “the wide-ranging sympatry of Cebus and Sapajus across much of the Amazon Basin” is the result of recent “invasion” by Sapajus which took place, she theorizes, ~400 kya. “It may be,” Alfaro et al suggest, “that the distribution of C[ebus] albifrons once extended throughout the Amazon and it has been extirpated gradually from the south and east” (where the incursion into Cebus territory by Sapajus is thought to have begun). Are we watching competitive exclusion in action? 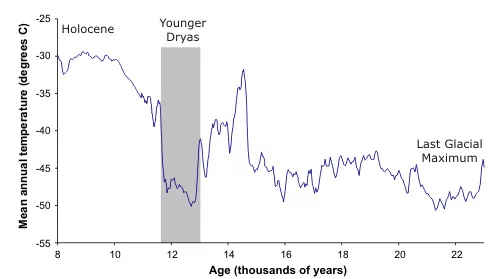 If so, the exclusion is happening at the relatively slow pace at which such dynamics must have moved before the sharp acceleration of technological development our species began to experience in the second half of the Pleistocene. The evolutionary history of our own family suggests, in any event, an affirmative answer to the question of whether different kinds (and sizes) of capuchin monkeys could have co-existed in the tool-using niche during the Pleistocene: around 1.9 mya some six hominin species, differing widely in body size, and, probably, technological attainment (Australopithecus sediba, Homo habilis, H. erectus, Paranthropus robustus, P. boisei and Kenyanthropus rudolfensis), shared that niche. Half a million years or more would go by before erectus, possessed by this time of the disruptively powerful capability of making fire, would elbow the last of its African tool-using competitors, P. robustus, out of that niche and into extinction. A last point before my conclusion: how could capuchin monkeys have lived in what’s now San Diego when their present-day range doesn’t even extend into Mexico? During the coldest phases of the 100,000-year cold-warm climatic cycles which we talked about earlier, arctic conditions dipped down into what’s now the Southern United States, sending caribou into present-day South Carolina, Georgia and northern Alabama. During the warmest parts of those cycles, sloths were found inside the Arctic circle and capybaras—a warmth-loving genus which doesn’t extend beyond Panama today—ranged from present-day Florida to California. A capybara tooth was, in fact, found at the Cerutti Mastodon site itself. There’s no arguing, as I said before, with either the archeological or the geochronological findings of the Cerutti site team. We can disagree with the conclusions the team drew from those findings, but (at least in my opinion) we have no choice but to accept that the mastodon’s femurs and molars were deliberately broken open with rocks some 130,000 years ago. It is precisely because these findings are dependable, that they’re so perplexing. Let’s talk, before we discuss the tenability of the idea that hominins were present in the New World 130 kya in more general terms, about some of specific puzzles posed by the Cerutti mastodon site itself. How did the beings who broke the mastodon’s femurs get through the animal’s skin and remove the tissue surrounding the bones to gain access to them? And how did they detach those femurs—i.e. sever the muscles and ligaments binding those femurs to the pelvis and the bones of the lower leg? If we assume the bone-breakers were human, an easy answer comes to mind: they must have sliced through the skin, muscles and ligaments in question with sharp stone cutters. Stone cutting-implements have been used by hominins to butcher carcasses for at least two and a half million years, and we can be confident that all members of the human family in existence 130 kya (including isolated outliers like the small “hobbits” that inhabited Flores island) knew how to make and use them. Neither cutting-tools, nor the chips of waste stone often produced by on-the-spot manufacture or retouching of such tools were, however, found at or near the Cerutti mastodon site. What about other signals of tool use? Hominins have been defleshing and disarticulating bones of proboscideans (members of the elephant family) with cutting-tools for nearly two million years. The characteristic marks left by such cutters are well-studied and unmistakable, but nothing of that kind was identified on any of the Cerutti mastodon’s bones either. The authors of the Cerutti paper explain this absence of cutting tools and cut-marks by arguing that the people who broke the bones in question weren’t trying get meat from this carcass. “You can repeat after me,” Tom Deméré said at discussion after the publication of the Cerutti claim, “this was not a kill or butchery site.” Deméré and his co-authors envisage instead that the putative hominins came upon “…a carcass that’s decomposed. It’s not useful for meat, but it is a source of raw material to produce bone tools.” Presumably because the marrow inside the mastodon’s bones would—like the rest of carcass—also have putrefied in this scenario, those hominins would not have broken the bones to access it, but the Cerutti team seems equivocal on that issue. The authors support their “raw material to produce bone tools” contention by reporting that portions of those broken femurs were missing from the site, but the skeleton was so incomplete that this argument can’t be a decisive one. How does my suggestion that a large capuchin or capuchins, sp. aff. Acrecebus frailey, may have smashed the mastodon’s bones and teeth, fit the facts of the Cerutti site? A capuchin resembling Acrecebus would not, despite its size, have been able to penetrate the skin of an intact mastodon carcass, nor cut away the tissue covering its bones. If it wanted to smash the femurs to extract their marrow, it would have had to wait, therefore, for the animal’s killers (one of the New World’s two sabertooth cats, Smilodon and Homotherium, or the giant short-faced bear Arctodus are the likeliest candidates) or for scavengers (one of several bear species, dire wolves, lions, jaguars, pumas, wolverines or coyotes) to make those bones accessible. The problem with that scenario is that the Cerutti investigators found no carnivoran tooth-marks on any of the mastodon’s bones. It’s possible, however, that a predator such as Smilodon could have eaten only the contents of the animal’s abdominal cavity, abandoning the carcass thereafter without turning its attentions to the musculoskeletal structures. 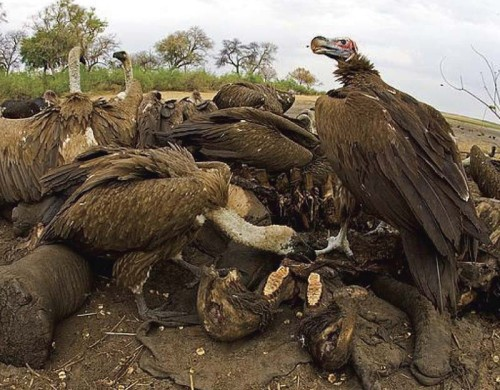 In such a scenario, the rest of the carcass may well have been consumed by avian rather than mammalian scavengers. The possibility that the mastodon’s carcass was stripped by birds exists, in fact, regardless of what caused its death. When 73% of the North American and 80% of South American mammal species weighing over 45 kg. disappeared at the end of the Pleistocene, at least ten genera of birds in the raptor/scavenger class followed them into extinction. Among those birds were Ciconia maltha, a New World version of Africa’s marabou stork, several large New World vultures, the large condor Breagyps, the “walking eagle” Buteogallus daggetti, and several members of the family Teratorthidea, whose largest species, the aptly-named Aiolornis incredibilis, had a sixteen-foot wing-span. Could members of one or more of these extinct species have exposed and disarticulated the mastodon’s femurs? Relatively small, gracile African vultures like the griffon, white-backed, hooded and Egyptian species can’t puncture the skins of Africa’s largest animals, and must await the arrival of either large mammalian carnivores, or of the lappet-faced vulture Torgos tracheliotos, a large, powerful bird with a nine-foot wingspan, to open such carcasses for them. 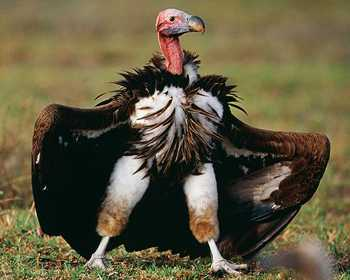 The heavy-duty bill of the Torgos vulture, adapted to the task of tearing the skins and tendons of megafauna like rhinos, elephants and hippos, resembles the wide, deep bills of the New World teratorns. Teratorns were, however, members of the Ciconiiformes (condors, American vultures, storks, herons and ibises) while Torgos falls into the eagle-hawk order Accipitriformes. 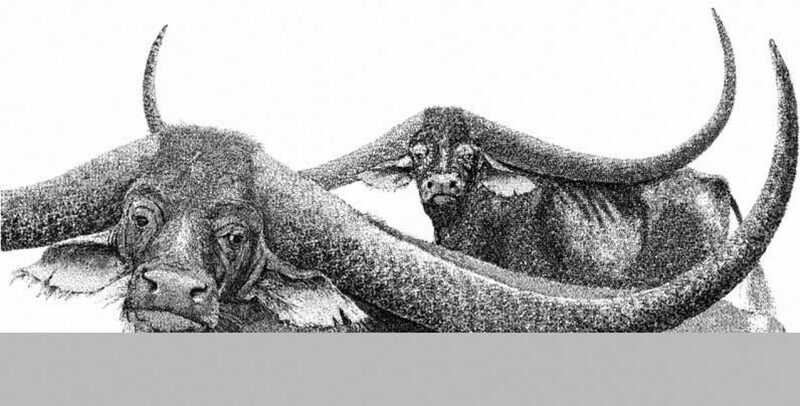 The resemblance between the bills of Torgos and those of the Teratornithae isn’t, therefore, a family trait, but the result, instead, of a convergent evolutionary response to the demands of scavenging the carcasses of megafauna. The larger teratorn species could probably deal with the skins and tendons of big animals at least as easily as Torgos can. It’s not unrealistic to suggest, therefore, that the Cerutti mastodon’s skin and flesh could have been stripped away, and some bones possibly disarticulated, by species of the New World’s extinct raptor/scavenger birds without the intervention of mammalian carnivores. Some of the Cerutti mastodon’s bones might have been have been scratched and scored by the beaks of avian scavengers. Would the signs of such scavenging still be recognizable today? While 130,000 years of bacterial and chemical action would not have removed the deep indentations, grooves and slide-marks made by the teeth of mammalian carnivores/scavengers (just as they could not erase the impact-marks on those bones), they may have effaced the relatively superficial marks of avian scavenging. The femur heads were found lying side by side. The other anomaly is the fact that one of the animal’s tusks was found in a vertical orientation, with its distal end—its point—pushed down into the substrate. These anomalies could, as the team argues, be consistent with a hominin presence at the site, but they do not indicate that hominin manipulation was the probable cause of, or a sine qua non of, their positions and orientations. Like humans, bison are relative newcomers to North America. Paleontological and paleogenomic evidence suggests that bison crossed over into the New World when the Bering Land Bridge was “open”—i.e. 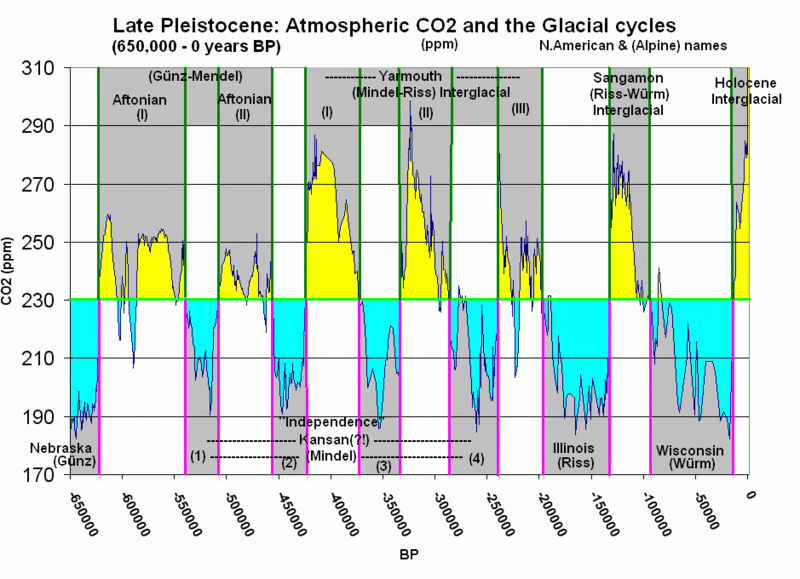 above sea level—during the next-to-last or “Illinoisan” glaciation ~195-135 kya (marine isotope 6). The latest date for the oldest securely-timed bison fossil in North America is approximately the same age as the Cerutti mastodon, i.e. 130 ky. Since there is no evidence that modern humans had emerged from Africa before 130 kya, the Cerutti investigators suggest that the hominins who smashed the mastodon’s bones could be “early” modern humans, Neanderthals, Denisovans or Homo erectus. Members of such groups could, in theory, have made the Illinoisan crossing at about the same time as the bison, but they would have required sewed (i.e. seamed) footwear and clothing to survive inside or near the Arctic Circle during the Illinoisan glaciation when temperatures in that region would have been even colder than they are now. Could any member of our genus living at the time of the Illinoisan glaciation (which ended some 140 kya) have possessed the technology (chiefly bone needles and thread made of plant fibers or sinews) to make the hoods, “mukluks” and “parkas” they would have needed to survive the dark, frozen Beringian winters? Relatively crude, eyeless “needles,” “awls” or “pins” fashioned from bone, and showing wear-patterns consistent with leatherwork, only show up in Africa—then the centre of human technological innovation—some 59 kya. Evidence of thread made of twisted fibers dates to ~30 kya in Europe  (which was by then supplanting Africa as the “big city” of human technology). The earliest eyed needles found to date, in Europe and Asia, are dated to ~25 kya. The suggestion that the putative human smashers of the Cerutti mastodon’s bones could have sailed to the New World in boats after the Illinoisan glaciation had given way to the Sangomanian interglacial, flooding the Bering land bridge just before 130 kya is equally unconvincing. Evidence that relatively short sea crossings had taken place more than 50 kya, (to Flores island across two straits, a puzzling ~1.1 mya; to Sulawesi between 118 and 194 kya across the Makassar strait; to Crete, >130 kya; and to Australia ~55 kya) has persuaded some commentators that humans or human-like beings had already developed seafaring skills at those distant times. However the fact that the vast majority of world’s islands, even islands relatively close to the earth’s continental land-masses such as those in the Caribbean and Mediterranean seas, were not visited or settled by humans until ~12-5 kya, suggests that only isolated and possibly accidental crossings on rafts and/or other buoyant objects or devices allowed a very few early human sea-crossers like the first hominins on Flores island, to make landfalls in sufficient numbers, to populate a small number of theretofore uninhabited islands and land masses. The late Pleistocene witnessed the extinction of 35 genera of North American mammals. The last appearance dates of 16 of these genera securely fall between 12,000 and 10,000 radiocarbon years ago (~13,800–11,400 calendar years B.P. ), although whether the absence of fossil occurrences for the remaining 19 genera from this time interval is the result of sampling error or temporally staggered extinctions is unclear. Analysis of the chronology of extinctions suggests that sampling error can explain the absence of terminal Pleistocene last appearance dates for the remaining 19 genera. The extinction chronology of North American Pleistocene mammals therefore can be characterized as a synchronous event that took place 12,000–10,000 radiocarbon years B.P. Results favor an extinction mechanism that is capable of wiping out up to 35 genera across a continent in a geologic instant. The giant American tortoise Hesperotestudo crassicola and several other member of its genus were among the many large animals which disappeared in the end-Pleistocene extinction spasm. We think of remote oceanic islands as the “natural” habitats of giant tortoises—as if there’s something about mid-oceanic air that makes tortoises grow big. Giant tortoises—some larger than the still-existing island species—were, however, living on all the earth’s continents except Antarctica some three million years ago while hominins were still confined to Africa, and still engaged in relatively rudimentary tool-use. At least three of these giants, Aldabrachelys laetoliensis, Stigmochelys brachygularis, and the large terrestrial turtle Latisternon microsulcae lived in Africa before they became extinct near the Pliocene-Pleistocene border over 2.5 million years ago. More than a quarter-century ago, the late Wilhelm Schüle of the Freiburger Institut für Paläowissenschaftliche Studien argued that the disappearance of these African giants was caused by tool-using hominins. Since the disappearance of those African giants, the spread of the hominin family out of its African homeland across the rest of the planet has been faithfully tracked by the disappearance of giant tortoise species in each of the regions it settled. The “hominins arrive, giant tortoises disappear” sequence first manifests itself when several large tortoise species, including the earth’s largest tortoise, the 1.8 meter tall, 1,000 kg. Megalochelys atlas, become extinct after hominins arrive in South Asia around two million years ago. That sequence is repeated when hominins cross the Wallace line to reach Flores island ~1.1 mya, when they reach Sulawesi ~150 kya; and when Homo sapiens reaches Australia some 50 kya. It is seen again when humans enter and settle the New World around 15 kya; when they reach the previously undiscovered islands of the Mediterranean sea between 7 and 9 kya; when they reach the Caribbean islands ~6 kya; when they sail to New Caledonia island, some eight hundred miles east of Australia about 3.5 kya; when they reach Vanuatu about 3.25 kya; when they land on Fiji 2.5 kya; when they settle Madagascar around 2.4 kya; and, finally, when Arab, Persian, Portuguese, Dutch, French and English ships start making landings on the last undiscovered Indian Ocean islands such as the Mascarenes, whose giant tortoises disappeared along with the dodo and 13 other bird species some 150 years after the humans discovered and settled those islands in the early 16th century. Giant tortoise species have only survived on the Galapagos and on Aldabra, an isolated Indian ocean atoll, because those islands were discovered at a time when Homo sapiens was already becoming aware of the need to protect other species from its own destructive power. It is highly unlikely, in the light of this history, that humans, or indeed any member of the genus Homo, could have co-existed with giant tortoises in the New World for over 100,000 years without exterminating them. Could this supposed ten-millennium peaceful co-existence between humans and giant tortoises the New World be explained, perhaps, by the possibility that the supposed 130 kya hominin arrivals never formed a large population? That they were restricted, perhaps, to a limited area? Could their population actually have shrunk, as one of the Cerutti team suggested, to the point of vanishing? It seems improbable that any member of the genus Homo, endowed with the unsought but commanding power of “ontogenetic innovation”— the ability to invent new behaviors and strategies to satisfy their needs rather than have to wait for natural selection to construct them—would have died out on a previously hominin-free continent replete with easy-to-exploit resources. By 130 kya all then-existing members of the human family had been able to make a variety of tools for hundreds of thousands of years, and were also (with the apparent exception of Homo floresiensis whose body proportions and chimpanzee-sized brain suggest an affinity with the australopithecine hominins that preceded Homo erectus) able to make and use fire. It’s difficult to imagine why immigrants with assets such as these would not have founded a large and enduring population in the Americas. I discussed, in this article, my reasons for rejecting the April 2017 conclusions of Holen et. al. that humans or other hominins smashed the Cerutti mastodon’s teeth and femurs. In putting forward my alternative hypothesis for that breakage, I pointed to the use which several present-day savannah-dwelling capuchin monkey species in the genus Sapajus make of hammer-and-anvil techniques to shatter the protective casings of edible fruits and nuts. I combined these facts with paleontological and ecological evidence suggesting a savanna-dwelling capuchin species considerably larger than any of the the existing capuchin species may have existed in the late Pleistocene. The possibility that the tool-using abilities of all savanna-dwelling capuchins were evolved as an adaptation to the fact that tools (including but not limited to hammerstones) can facilitate, or are required for, the exploitation of many savanna foods, combined with the lack of any other evidence for a hominin presence in the New World anywhere in the vicinity of 130 kya, creates, in my view, a serious possibility that the teeth and femurs of the Cerutti mastodon were smashed by a large, tool-using capuchin sp. aff. Acrecebus frailey, and that the Cerutti team’s conclusion that hominins must have been been present in the New World ~130 kya is not, therefore, as Richard Fullagar suggests, a “truly incontrovertible” one. Dillehay, T. D.(Editor). 1989. Monte Verde: A Late Pleistocene Settlement in Chile Vol. 1 Washington, DC: Smithsonian Institution Press. Lewin, Roger. 1989. Skepticism fades over pre-Clovis man. Nature, 244,1140. Skoglund P., Mallick S., Bortolini M.C., Chennagiri N., Hunemeier T., Petzl-Erler M.L., Salzano F.M., Patterson N., and Reich D. 2015. Genetic evidence for two founding populations of the Americas. Nature 525, 104–108. Holen, S.R., and Holen, K. 2013. The Mammoth Steppe hypothesis: The Middle Wisconsin (Oxygen Isotope Stage 3) peopling of North America. In Paleoamerican Odyssey, In: Graf K.E et al. (Eds. ), pp. 429–444. College Station: Center for the Study of the First Americans, Texas A&M University. Leakey L.S.B., De Ette Simpson R. & Clements T. 1968. Archaeological Investigations in the Calico Mountains, California: Preliminary Report. Science 160, 1022–1023 (1968). Greshko M. 2017. Humans in California 130,000 Years Ago? Get the Facts. National Geographic, April 26. Wong, K. 2017. Ancient Bones Spark Fresh Debate over First Humans in the Americas. Scientific American, April 26. Mannu M. and Ottoni E.B. 2009. 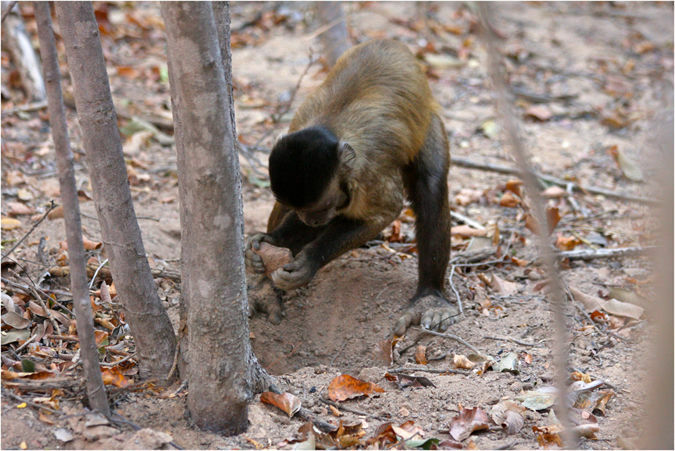 The Enhanced Tool-Kit of Two Groups of Wild Bearded Capuchin Monkeys in the Caatinga: Tool Making, Associative Use, and Secondary Tools. American Journal of Primatology, 71: 242-251. Lynch Alfaro et al., 2012, pp. 6–7. Backwell, L. et al. 2008. Early Hominid Bone Tools from Drimolen, South Africa. Journal of Archaeological Science 35, 2891.